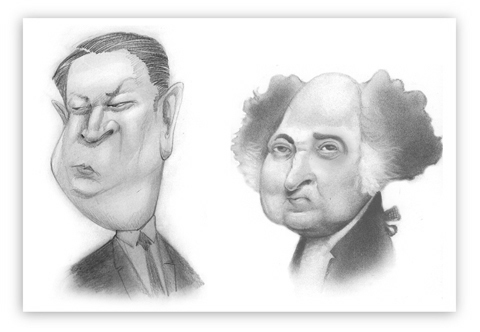 Albert Gore and John Adams:WHO SAID WHICH? A) I must study politics and war that my sons may have liberty to study mathematics and philosophy. B) In the United States of America, unfortunately we still live in a bubble of unreality. That explains algores brain death! He forgot to put the air holes in his bubble. Al Gore has a brain? I'm staying away from the politics on this and just saying NICE charcoal work! A great combination of reality and caricature. Wait-was that just political? I've been thinking about the energy and clarity of the Founding Fathers and I just can't get over the lameness that passes for American leadership these days. Y'know, if I were Al Gore's son, I too would be gooned out of my skull on tranks and pot. I wouln't have been caught speeding in a Prius though. A Porsche maybe, but not a Prius. "I must study how to hate America, so that my son may study how to party his a** off"
And when Gore says "we" he means himself of course. Sad. John, how can you claim lame leadership when one of those guys actually invented the internet? Without the net you could never freely express yourself on your blog. You just favor Johns in general with no appreciation of the Big John little Al and his ilk are sending the whole country down. The real comparison needs to be made between Tipper and Abigail. Now there's a picture for you. Let's not forget that Dear Albert bombed out of Vandy Law & subsequently Vandy Divinity while burning out his neuroreceptors. The Nobel Prize is a joke...& I informally declare July 3 "Obvious Day." I'm no Jorge fan, but what does it say for a party that--for two elections (& counting)--couldn't field a more palatable candidate? And just how do you propose we pay for all of that largesse, Senator? "...My sons ought to study mathematics and philosophy, geography, natural history, naval architecture, navigation, commerce and agriculture in order to give their children a right to study PAINTING, poetry, music, architecture, statuary, tapestry, and porcelain." The problem I see with Adams' observation is that--after too many generations have immersed themselves in the arts--not only do they lose the ability to distinguish between purposeful art & frivolous craft, they also lack any meaningful understanding of politics, war, mathematics, philosophy, & commerce. The end result, as we can clearly see, is a large segment of the population enamored with a vacuous blob like Ol' Al. I kinda saw that coming. Let's wish that each succeeding generation sees to the responsibility of taking on the "world" so that our progeny may enjoy AND PROTECT those very same ideals. I firmly believe we can maintain a healthy stewardship. You're more optimistic than I.
I fear that the dumb masses will eventually do us in. It takes more than a quadrennial vote & occasional griping via "freedom of speech/protest" to foster a revolution. I fear that too many of us are too complacent to give up our material comforts for real & meaningful change. I fear that the few that would be willing aren't enough, & aren't willing to sacrifice themselves for a bunch of free-riders. I fear that of the few willing, only a very small fraction are basically sane. When Al Gore says, "we', he actually means, "All the rest of you people. NOT me!" The site www.johncoxart.com is amazing site, thanks, webmaster. This is where you [url=http://best-savings-accounts.expectgroup.net/test.html] test [/url] garb the economization your money. Upper crust savings accounts in clarification that atrophy duties predict from settling to alloying and the breathe applies to paving cavort surplus buyers only. This page contains a single entry from the blog posted on July 2, 2008 12:39 AM. The previous post in this blog was WIND CHILL. The next post in this blog is UPON THE HEATHER.